Right off, I have to admit that I am a sucker for werewolves. I have always had a place in my heart for them, and I find them the most fascinating of all the creatures who go bump in the dark. So I am a willing reader of lycanthropic stories. High Moor mostly delivers. The novel opens with an outbreak of werewolf-related violence in the UK some 20-plus years ago, people being torn apart in bloody orgies of destruction. The police are baffled by the deaths, and fear pervades the community. The storyline initially follows a young brother and sister and their friend, a cop who discovers the truth in the cause of the killings, and an American werewolf hunter. It turns out that the initial killings are being done by a "moonstruck" werewolf, someone who cannot control her animal urges and becomes a mindless creature of death and destruction. Other weres try and keep a lid on the situation. They can control their changings, and they strive to blend into society, letting no one know of their abilities. I will write up front that many of the prime characters meet their end, both back in the early part of the novel and then again when the timeline jumps up to the present. And most of their deaths are quite graphic in detail. One of the difficulties in writing a tale where so many people die is how to describe their deaths in a way which elicits horror, but does not become mind-numbingly repetitive. Just how many ways can a writer describe a bite to the throat and still evoke a sense of horror? In this case, the author does a very credible job of managing this difficult task. The violence is quite gory, but each scene brings something new. Characterization is a strong point in the novel. I usually find when reading that children are merely little adults, or on the other side of the scale, unbelievable golems without depth or substance. Reynolds, however, is able to create entirely believable and complex kids, kids who are different from each other and with their own personalities, but who are still kids in the proper stage of their mental development. I also like the author's writing style in setting the stage for his story. His background descriptions of places, what other people are doing, and surrounding details give depth and a sense of verisimilitude to the tale while still being unobtrusive. These details don't intrude on the storyline but rather meld into one nice, fulfilling tale. As a reader, I am somewhat of a stickler on being true to what a "real" werewolf is. Werewolves should not given powers which do not follow the traditional tales, nor should they exhibit weaknesses not traditionally attributed to them. Of course, I realize this is pretty silly as there is no biological basis for the werewolf myth, and while most civilizations have weres in their cultural identity, Chinese weres are different from European weres which are different from Native American weres which are different from Sub-Saharan African weres. But as I was first introduced to people changing into animals with the Western European werewolf myth, that is how I generally base the "authenticity" of stories about werewolves. And Reynolds generally scores well on this somewhat specious area of judgement. His explanations mostly ring true, and events tend to reflect the myth. I was confused, though, on the difference between the Lon Chaney-type werewolf, who stands on his two legs and is rather manlike and the werewolves who actually turned into four-legged wolves. I may have missed it an explanation of that, but it was a little disconcerting to me on how the two separate versions of the werewolf myth interacted in this story. And as a "purist," (which is really a pretty silly concept with regards to a mythical creature) I give weight to the animal werewolves as I feel the two-legged man-like variety are basically creations of Hollywood, to the best of my knowledge, when there was no CGI and the easiest way to create a werewolf was to put an actor in a furry suit and give him some make-up. On a weak note, I thought the ending was somewhat abrupt and lacking closure. I hope this is indicative that a sequel is in the offing. And my feeling of unfinished business my have been influenced by the fact that I read this on a Kindle, and as there was a sample of another book following High Moor, I was at 94%, getting more and more excited but knowing that there was still 5% of the novel left to bring the tale to a conclusion. Then, the novel suddenly ended, to my surprise. Overall, this is really quite a good book. I enjoyed it. Yes, I like werewolf stories and would enjoy a werewolf novel more than, let's say, a vampire novel written with the same degree of competence. But I do think this novel would be enjoyable to anyone regardless of their predilection to werewolves in general. 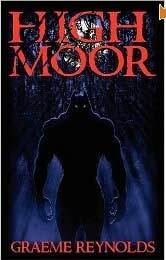 For more reviews or to buy High Moor from Amazon.com, click here.